Scientists discovered how to extract stem cells from human embryos in the early 2000s. Stem cell research got many people excited but there was a lot of controversy and suspicion surrounding this breakthrough. We haven’t heard much about stem cell research since then, but there are some medical professionals are using the technology: veterinarians. More than 12,000 animals have been treated with stem cell therapy in the U.S. since 2004. The trend started with racehorses but is now available to domestic animals. The industry is worth $20 million a year – that’s small compared to the $2 billion dollars Americans spent on pharmaceutical drugs for their pets in 2014. But the industry is expanding fast. There are three companies offering stem cell therapy for pets. A new facility opened in New York in August. Tony Yuan owns a company called Mobile Stem Care in San Antonio. He says business is good because a lot of people are willing to spend serious money on their pets. Roger Burton is one of his customers. A long-time hunter, Burton noticed that his Lewellin Setter, Reece, was limping out on the fields. He had never really thought about stem cell therapy for animals, but his doctor convinced him that the risks were minimal. Burton paid upwards of a thousand dollars for the treatment. “I haven’t run across a situation yet where I haven’t done a procedure because of cost,” Burton says. HIs veterinarian, doctor Rachel Smith says she’s never seen patients so willing to spend money on their pets – just think of memory foam dog bed and pet health insurance. Tony Yuan says that sentiment translates into medical procedures, so the margins for animal stem cell therapy are good. He says it would take him about $20 to bring stem cell therapy to humans. Doug Frantz teaches bio-medical engineering at the University of Texas San Antonio. He says it will probably be another 10 years before humans can be treated with this type of therapy – and that’s a good thing. For the FDA to approve a drug or medical procedure for humans, it has to be better than the existing gold standard. For animals, the procedure has to just be proven safe. Scientists around the world are running hundreds of clinical trials proving the effectiveness of stem cell therapy in humans – and that is going to take a while. That doesn’t stop people like Roger Burton from daydreaming about getting the same procedure as his dog. “I have a torn meniscus in one of my knees and I would love to have it done today,” Burton says. But that’s not going to happen anytime soon without FDA approval. You might have heard warnings about the potential for malicious computer hackers to sabotage infrastructure like electric utilities. Turns out, there may be a bigger threat: squirrels. Thanks to pop culture and politics, one might suspect the threat of hackers taking down our power grid is all but imminent. President Obama has addressed the issue extensively, and National Geographic even dedicated a feature-length movie to the possibility – the much-tweeted about 2013 movie “American Blackout.” But, the next time you see or hear somebody freaking out about hackers, maybe you should bring up squirrels. In Austin and elsewhere, acorn-packing squirrels have a higher chance of creating a serious power outage than a malware-peddling malcontent. If a squirrel runs across two different power lines at the same time or touches both a power line and a tree, not only is the poor little squirrel toast, there’s a good chance that the power line is as well. Carlos Cordova, a spokesperson for Austin Energy, says squirrels accounted for or contributed to roughly 400 power outages in Austin last year – a span of time in which hackers caused zero global power outages. The proliferation of squirrel-related outages has even inspired a data journalist to tabulate the phenomenon. The anonymous observer known as “Cyber Squirrel 1” runs a website and a Twitter account that documents outages accredited to squirrels and other critters. He’s taken on the persona of the chief propaganda minister of the squirrel army. They’ve had 702 successful power outage operations worldwide. The interactive map is a silly way to transmit a serious message. Cyber Squirrel 1 says that’s a good thing. But, just like Y2K or any other existential threat associated with technology, the doomsday rhetoric can get a little conflated sometimes. In Sync: Is Sharing Your Online Calendar A Relationship Milestone? People in love have always savored their relationship milestones: the first date, the first I-love-you’s, meeting each other’s families. Modern relationships come with their own special milestones, like swapping Wi-Fi passwords, becoming Facebook official, taking down your online dating profiles, and increasingly often, choosing to share your online calendar. These days, more couples are discussing whether to make their online calendarsvisible to each other. It was even a plot point in the pilot episode of Jane the Virgin. 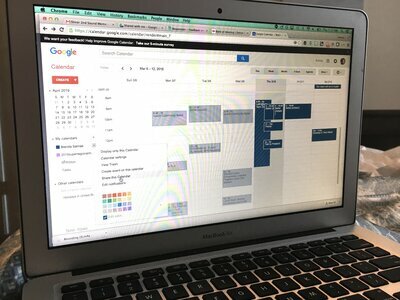 The upside to being calendar connected: You can avoid pesky scheduling conflicts. The downside: It can feel kind of intrusive and kind of unromantic. How Many People Are Calendar Connected? The study also found that 27 percent of committed couples share an email address. “Older adults and those who have been in their relationship for longer than ten years are especially likely to share an email account,” Pew said. Among younger couples, anecdotally it seems to be much more common to sync your separate online calendars than to share the same email address. If you’re under 40 and have the same email address as your partner, you’re a freak. You know that. To get a better idea of how many couples are calendar connected, I tapped into my own social networks to do an informal survey. It was anecdotal, completely unscientific and highly informative. So far, around half of all couples surveyed (about 30 people answered, all under 40) said they share their online calendars with each other. Fifteen percent of the respondents said they aren’t currently calendar connected, but wouldn’t mind if their partner asked. A quarter of the people I asked think sharing your online calendar with your partner is really weird. Conflict Resolver Or Romance Killer? From a technical standpoint, it’s very easy to make your calendar visible to your loved ones. But psychologically speaking, figuring out whether you want to share that much information can be a complex decision. A Pew survey found that 11 percent of couples share an online calendar and more than one out of four couples share an email address. Do you really want to know where your partner is at all times? Do you want them knowing where you are? New York city resident Aurora Almendral and her partner have even managed to find a little romance in syncing their calendars. “The calendar is another layer of connection we have during the day. We often put flirtatious ‘appointments’ there for the other to find,” Almendral says. For some couples, a shared calendar is just a jumping-off point. There are dozens of mobile apps designed to keep couples organized. The apps have different features centered around a shared calendar but also include to-do lists, grocery lists, digital scrapbooks, conflict resolution tips and GPS trackers. And for couples that are no longer couples, there are calendar apps to help sort out custody agreements. Is syncing calendars the new Facebook official? A quarter of the respondents to the informal survey said they consider sharing their calendar a relationship milestone. Michael Spitzer-Rubenstein started sharing his calendar with his girlfriend after she forgot that his parents were coming into town one weekend. Even though the Brooklyn resident sees being calendar connected “mainly as an utilitarian thing,” there is the occasional head-scratcher. “There are sometimes events on the calendar where I don’t know what it refers to because I’m not the only one adding events to my calendar,” he says. Road rage can be a big problem — especially if one of the people is on a bicycle. Now some cyclists are using a new tool: tiny cameras to record their rides.